Recently I learned a very valuable lesson, one that I had to relearn actually. Don’t you just hate when that happens? I guess sometimes we or in my case, I am just so stubborn and weak we fail to learn the first or even the second time. This time I let my defenses down. I allowed my emotions to become overwhelmed by the situation and instead of thinking clearly I rushed to conclusions. Unfortunately, that’s part of being human, fortunately, we learn to pick ourselves up again and become stronger. When we start to believe everything we hear and doubt our own judgement, it becomes a dangerous thing. 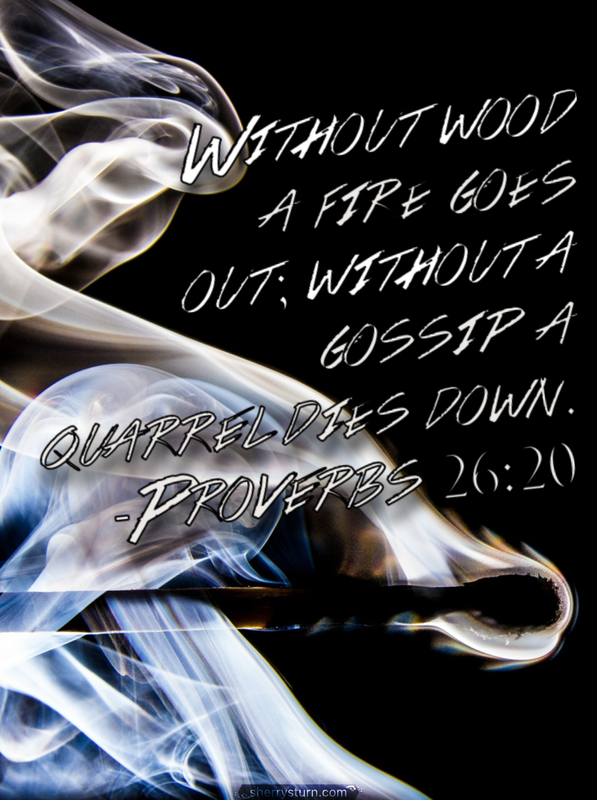 In Proverbs 16:28 it says, “A perverse person stirs up conflict, and a gossip separates close friends.” And in 20:19 it says, “A gossip betrays a confidence; so avoid anyone who talks too much.” How much more clear can that be? But sometimes, we forget that and listen to those who want to feed us with their version of the truth. This can only cause discord, confusion and hurt feelings. As Christians, we should avoid gossip altogether but we all know, Christians can be the very best gossips of all. Come on, you know it’s true. They can’t wait to share about “WhatsHerName’s” latest drama with her husband to all who will listen. Or can’t wait to spread “WhatsHisName’s” terrible situation at home. Whatever it is, they thrive on it and we get hooked in. That is what happened to me recently, I got hooked in. Fortunately for me, I was able to defuse the situation myself by finding out the facts and confronting the situation head on. Not relying on what others had said, but looking at all factors and seeing things firsthand. When we look at things with an open heart and mind, God will lead you and you will know what and how to deal with any situation, no matter how big or small. It’s really that easy. I find it funny that so many think being a Christian is such hard work, it’s actually much harder not to be. Believe me, I tried.